You do not know which URL is experiencing an error. The error happens intermittently, and you are not able to manually reproduce it (the error may depend on user input or external operating conditions that may happen infrequently). The error only happens in the production environment. This can make it very hard to define what the error is, and even harder to diagnose it. You may be able to determine which URLs are causing the errors by inspecting the request logs or an error log, but you may still have trouble determining what caused the error to happen. Internet Information Services (IIS) and above makes it easier to track down and diagnose these difficult error conditions with Failed Request Tracing, which lets you create failure definitions that automatically capture detailed execution traces of certain requests. 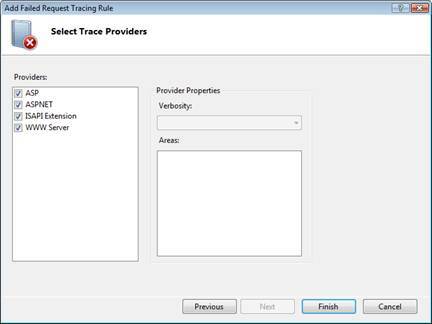 See Troubleshooting Failed Requests Using Tracing in IIS 7.0 and Above and Using Failed Request Tracing to Trace Rewrite Rules. 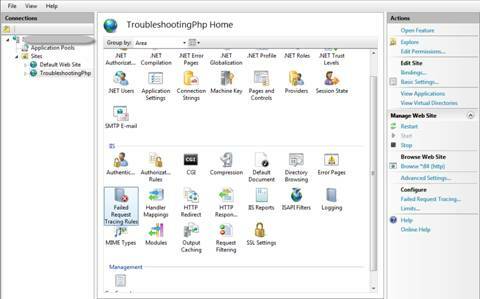 This article is based on a hands-on lab from the PHP on Windows Training Kit. To help with PHP diagnostics, these traces can also be made to capture the request input data and the response data from PHP. This can provide the insight needed to diagnose these error conditions. A blocking I/O operation on a file or network takes a long time to complete, such as when accessing a remote Web service or database. The code has a bug that causes it to enter into an endless (or long-running) loop, possibly also spinning the CPU or allocating memory. The code hangs or deadlocks on a shared resource or lock. These conditions result in long wait times or timeouts for the user making the request, and the conditions can also negatively impact the performance of the application and even the server as a whole. IIS provides a quick way to determine which requests are hanging by inspecting the currently executing requests. Failed Request Tracing can be an effective way of tracking down intermittent or hard to reproduce error conditions and diagnosing the error conditions by inspecting details about the request, response, and the wealth of trace events from IIS modules. 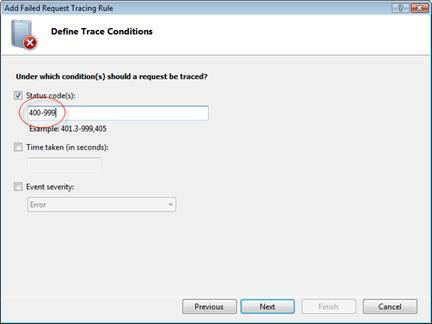 Failed Request Tracing can be used in a production environment since it can be configured to only trace requests that meet the specific failure definition and can avoid most of the tracing overhead for successful requests. Switch to IIS Manager. If it is closed, click Start,and then click Internet Information Services (IIS) Manager. Expand the Server node, and then expand the Sites node. In the tree view on the left, locate and click the name of the site. Under IIS, double-click Failed Request Tracing Rules. 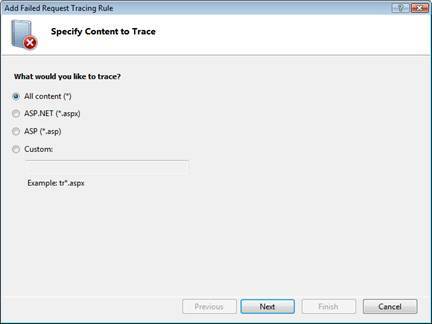 Now, create a Failed Request Tracing rule. Click Add. Leave the All content option selected. Type 400-999 in the Status code(s) text box. Leave the default trace providers enabled. Request http://localhost:84/products.php?productid=5 (this page produces an error). Click Start, and then select Command Prompt to open the Command Prompt window. - The Products.php page caused an error. - The input that caused an error is most likely **product=5**, as you don't see failures for other querystrings (this conclusion would be more accurate if this page is accessed frequently; in that case you will see multiple errors only for this specific querystring). Inspect the trace log. Open the trace log file in the browser, using the path specified in the previous output (that is, C:\inetpub\logs\FailedReqLogFiles\W3SVC2\fr000001.xml). The Summary tab gives basic information about the request. 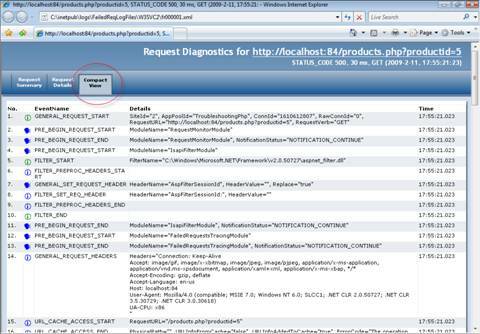 You can see that the error status was set by the FastCGIModule, which suggests that the error came from PHP. In other cases, you may see that the error came from other IIS modules, in which case you could use the wealth of tracing information in the log to determine why. In this case, however, you need to actually see the response that was generated by PHP to get more insight into the error. Click the Compact View tab. This tab shows the detailed list of trace events generated by IIS and IIS modules during the processing of the request. GENERAL_REQUEST_START event shows some basic information, including the request URL, verb, runtime information about the site, and application to which the request was dispatched. GENERAL_REQUEST_HEADERS event gives the complete list of headers, which in some cases may be significant when determining which user input may have lead to the error. GENERAL_RESPONSE_HEADERS and GENERAL_RESPONSE_ENTITY_BUFFER events provide the complete response headers and the response body that was sent to the client. In this case, the response body provides the additional information needed to diagnose the error, indicating an incorrect product ID. 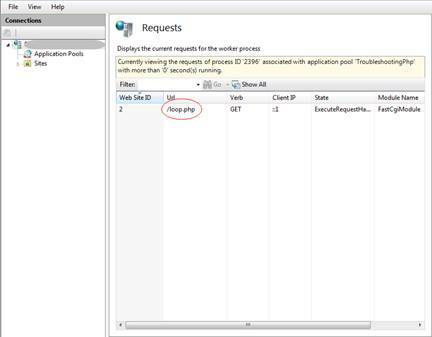 The Request Summary panel provides a summary of the request, its result, and also highlights any warning or error events during the request execution. The Request Details panel provides a hierarchical view of the request execution, also allowing you to filter the events by various categories such as Module notifications, Authentication/Authorization, etc. It also offers the Performance View, which helps you understand which parts of execution took the longest time. The Compact View offers the complete list of events, including a wealth of information about the request execution. Many of the IIS modules produce information about their execution that can be used to understand various aspects of the request processing and the outcome. 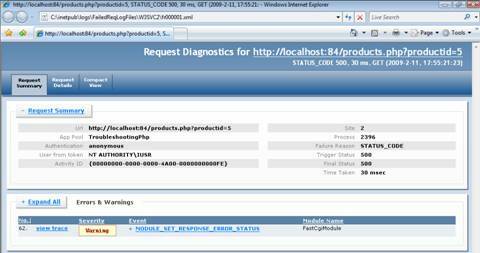 This information can be invaluable when troubleshooting complex interactions, such as URL rewriting or authentication. This provides a quick way to determine which requests are hanging by inspecting the currently executing requests in IIS. Click Start, and then select Internet Information Services (IIS) Manager. In the tree view on the left, click on the Server node. 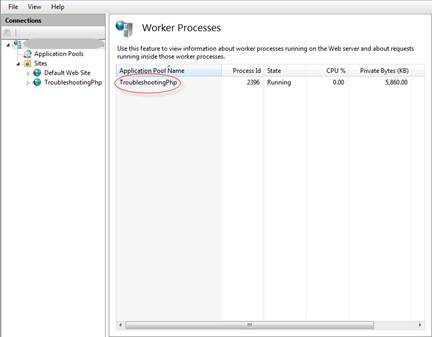 Under IIS, double-click Worker Processes. Switch over to a Web browser, and refresh the page if the page has timed out. This may need to be done throughout these steps. Switch back to IIS Manager, and then refresh the Requests view. That the request has been executing for some time (Time Elapsed). The URL of the request (in this case, /loop.php). You can refresh the view several times to observe that the same request continues to execute in the same stage, pointing out the hanging request. Determine which request is hanging using the command prompt. With the command prompt, you can filter out the requests of interest, for example requests to a specific application or a specific URL. It can be used to automate scripts that monitor currently executing requests. Open the Command Prompt window by clicking Start, and then selecting Command Prompt. Switch to a Web browser, and then refresh the http://localhost:84/loop.php page. (Note that loop.php is a sample name; the name of your page should be used.) You may need to continually refresh this page for the following steps. Switch to the command prompt. Note: This article uses material from the PHP on Windows Training Kit, published on August 25, 2009.